Do you want to create a home entertainment area your family hates to leave? One of the best home entertainment areas to create for your home is a backyard movie theater. 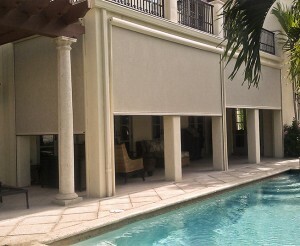 Carroll Awning Company is here to help you design a stylish backyard movie theater with our custom screen rolls. Spring and summer are perfect seasons to enjoy your favorite movies right in your backyard. Your family and friends can enjoy great food, great drinks and even some stargazing during backyard movie nights. How do you create the perfect backyard movie theater? For one, you need to identify a good spot in your backyard. The spot should provide a comfortable space for seating not too close or too far from the screen. The projector will need a good placement as well. You can place your projector on a sturdy table. With Sunesta screen rolls, you can have a quality screen for movie watching and Sunesta screen rolls for privacy and shade. Sunesta screen rolls are lightweight and you can have automatic screen rolls installed for easy movie theater setup. With a quality audio system and our custom Sunesta screen rolls, you can enjoy both DVD and Bluray movies at your convenience. Installing Sunesta screen rolls is a cost-effective way to build a wonderful backyard theater without sacrificing style or quality. Carroll Awning Company understands that every backyard is different and we are here to accommodate every homeowner’s special needs. It’s not challenging at all to move home theater technology to your backyard patio or screened porch. Carroll Awning will properly size your screen for the best film projections. The best Sunesta screen rolls for film projections will be light in color and the surface will prevent shining. Sunesta screen rolls are perfect roll down movie theater screens because they are ready-made, inexpensive and widely available for use. Your Sunesta screen rolls will not wrinkle. They will not bend. Learn more about the benefits of Sunesta screen rolls today. For more information on Retractable Awnings, Sunesta Screens and a free quotation call Carroll Awning at 1-800-999-5617 or click here today!